“‘For this is what the Sovereign Lord says: I myself will search for my sheep and look after them. 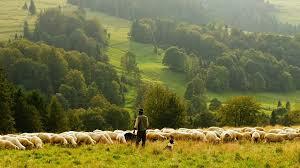 As a shepherd looks after his scattered flock when he is with them, so will I look after my sheep. I will rescue them from all the places where they were scattered on a day of clouds and darkness. I will bring them out from the nations and gather them from the countries, and I will bring them into their own land. I myself will tend my sheep and have them lie down, declares the Sovereign Lord. I will search for the lost and bring back the strays. I will bind up the injured and strengthen the weak, but the sleek and the strong I will destroy. I will shepherd the flock with justice".